How could we not use this metaphor when describing Dr Jadavji’s (@Nafisa_10) work? It’s just too perfect. 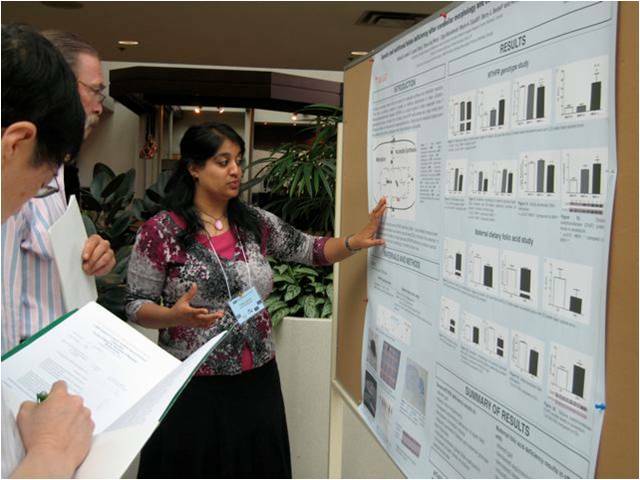 Nafisa is a neuroscientist; a postdoctoral fellow researcher and instructor at Carleton University and the University of Ottawa, in Ottawa, Canada. Her post-doctoral research focuses on understanding how dietary and genetic deficiencies in one carbon metabolism, specifically, folate metabolism, affects neurological function over the lifespan using a mouse model. See what we mean about the metaphor being almost too accurate? After completing her PhD at McGill University in Montréal, Canada, Nafisa followed that up with her postdoctoral training at the Charité Medical University in Berlin, Germany. She has been widely published, including in Behavioural Brain Research, Molecular and Cellular Neuroscience, and Environmental Epigenetics, to name just a few. She has been funded by the Federation of European Neuroscience Society (Europe), NeuroWIND (Germany), Canadian Association for Neuroscience, Canadian Institutes of Health Research, National Science & Engineering Research Council (Canada), International Brain Research Organization, Parkinson’s disease Foundation (US), Burroughs Wellcome Fund (US) and Fonds de la recherché en santé Québec (Canada). She is a regular reviewer for the Journal of Cerebral Blood Flow and Metabolism, Neurotoxicity Research, Journal of Molecular Medicine and Neuroscience. Currently, Dr. Jadavji is an Editorial member for Updates in Nutritional Disorders and Therapy and JSM Nutritional Disorders Journals. She is also the Chair of the Board of Directors for the Journal of Young Investigators (JYI). Gosh, now we feel pretty unaccomplished! I really liked science in high school. In grade 12 Biology, we learned all about the synapse and neuromuscular junction. Since then I have been hooked on neuroscience. I sort of fell into my current research focus after my PhD. My doctoral thesis focused how nutrition affected normal brain function. Since beginning my postdoctoral training I have been focused on how nutrition affects the diseased brain. I am interested in how one-carbon metabolism affects the brain. I use a mouse model to answer my research questions. I am specifically interested in assessing the impact of nutrition and aging on neurodegeneration and strokes. I am trying to identify and understand how nutrition can help change the brain to better protect it from damage. I think that this is very relevant to the public, especially with my focus on aging. I am also the Chair of the Board of Directors for the Journal of Young Investigators (www.jyi.org) an online undergraduate research journal. I really enjoy the work I do with JYI and working with the many talented undergraduates. I recently took up knitting. I don’t do it as much as I would like to, but I enjoy it a lot. It’s also a great distraction from science. I really like to bake, I eat gluten free and so baking is a challenge sometimes, but I am learning some good tricks. My ideal day off would involve not doing a lot. I would sleep in and have a big breakfast with pancakes or fancy eggs. Then I would either go for a run or to the gym. In the evening, I would prepare a nice meal and maybe dessert with my partner. I really enjoy cooking and baking. I would also watch something on Netflix, right now I am watching Sherlock and soon I will watch the new season of House of Cards. Please welcome Nafisa to Real Scientists! Zombie brains! Timothy Verstynen joins Real Scientists!